As of February 2001 Kappa Epsilon Zeta Chapter forged a partnership with The Learning Tree Cultural Preparatory School (TLT) of The Bronx. A private, non-profit institution, the school operates on personal donations, community support, small business endowments, student tuition and modest grants. Prior to moving into their own building in September 2000, the school had been servicing it’s over 150 students in various church basements & buildings for the last 25+ years by the Grace of God and the vision of its founder and principal, Sister Lois Gregory. The school is constantly in need of many things, from garbage bags/cleaning supplies & lockers to books & pens for the students. 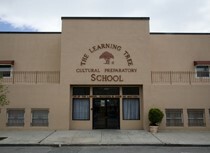 To learn more about The Learning Tree please visit their website at www.learningtreeprep.org. On Saturday, December 1, 2012, at 12 noon, a new and exciting “joint” organizational committee was formed between the men of Phi Beta Sigma Fraternity, Inc., Beta Psi Sigma Chapter and the ladies of Zeta Phi Beta Sorority, Inc. Kappa Epsilon Zeta Chapter. On this particular afternoon, Sorors and Frat met to develop the goals and objectives for the “Joint Adopt-A-School committee” at the Women’s Academy of Excellence. This extremely productive joint committee meeting focused on planning our involvement in the upcoming TLT Kwanzaa Fair, as well as brainstorming to plan activities for Blue Week. The purpose of this joint committee was to establish the details, parameters and logistics of the two main “joint” Sigma-Zeta community events to be planned with The Learning Tree.